Monocle Size 1 5/8 inches ROUND An O, So Unique, So Nostalgic and romantic reading device. The one-lensed monocle, an item favored by 19th-century military men, robber barons and Mr. Peanut, is finding itself wedged anew into the ocular sockets of would-be gentlemen seeking to emulate the stern countenances of their stuffy forebears. 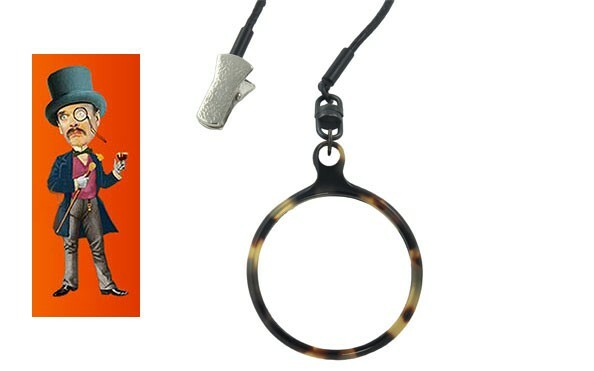 Monocle fits into eye socket, is attached by a soft leather string to a clip on lapel or pocket. For a quick read, but a lasting impression. Great gift idea for that special someone. Made in Italy. This item cannot be returned nor exchanged. You may also want to consider our elegant PINCE NEZ, lots of attitude!